When India was invented as a "modern" country in the years after Independence in 1947 it styled itself as a secular, federal, democratic Republic committed to an ideology of development. Nehru's India never quite fulfilled this promise, but more recently his vision of India has been challenged by two "revolts of the elites": those of economic liberalization and Hindu nationalism. These revolts have been challenged, in turn, by various movements, including those of India's "Backward Classes". These movements have exploited the democratic spaces of India both to challenge for power and to contest prevailing accounts of politics, the state and modernity. Reinventing India offers an analytical account of the history of modern India and of its contemporary reinvention. Part One traces India's transformation under colonial rule, and the ideas and social forces which underlay the deliberations of the Constituent Assembly in 1946 to consider the shaping of the post-colonial state. Part Two then narrates the story of the making and unmaking of this modern India in the period from 1950 to the present day. It pays attention to both economic and political developments, and engages with the interpretations of India's recent history through key writers such as Francine Frankel, Sudipta Kaviraj and Partha Chatterjee. Part Three consists of chapters on the dialectics of economic reform, religion, the politics of Hindu nationalism, and on popular democracy. These chapters articulate a distinct position on the state and society in India at the end of the century, and they allow the authors to engage with the key debates which concern public intellectuals in contemporary India. Reinventing India is a lucid and eminently readable account of the transformations which are shaking India more than fifty years after Independence. It will be welcomed by all students of South Asia, and will be of interest to students of comparative politics and development studies. Stuart Corbridge is Professor of International Studies, University of Miami and Fellow of Sidney Sussex College, Cambridge University. John Harriss is Reader in Development Studies at the London School of Economics. Map 1 Territorial growth of the East India Company, to 1843. Part 1: The Invention of Modern India. Chapter 1: The Light of Asia? India in 1947. Chapter 2: 'Sovereign, Democratic, Federal, Socialist, Secular': the Invention of Modern India. Chapter 3: the 'Tall Men' and the 'Third way': Nehru, Patel and the Building of Modern India. Chapter 4: Jealous Populism, Crises and Instability: Indira's India. Chapter 5: Drifting Towards Catastrophe: The Powerlessness of the Congress. Chapter 6: 'Elite Revolts': Reforming and Reinventing India in the 1990s. Part Three: The Reinvention of India. Chapter 7: The Dialectics of Reform: the State and Economic Liberalization. Chapter 8: The Guilty men? Militant Hinduism and the Politics of Anti-Secularism. Chapter 9: Transfers of Power? Subaltern Politics, Sites of Empowerment and the Reshaping of India's Democracy. 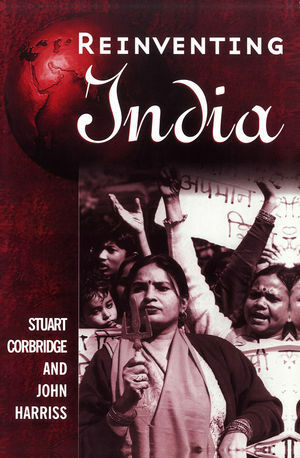 A comprehensive treatment of the development and political econmy of India from c. 1947-1999.